Ellen Boughn - sometimes referred to as the guru of microstocks - is a former photo agency executive with more than 30 years experience in the stock photography business. 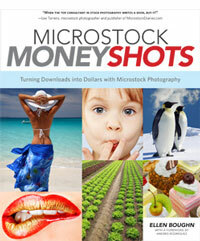 She is the author of Turning Downloads into Dollars with Microstock Photography (2010). The book provides detailed advice on all the aspects of selling your own photos - from getting started to knowing what kinds of photos are in demand, from understanding the fine print on permits to reaching speciality markets. For more information on this author please go to http://www.ellenboughn.com/ .